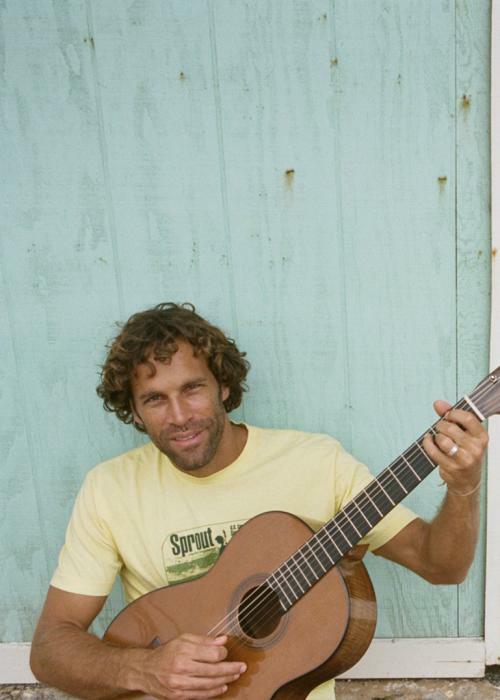 When choosing a title for his seventh studio album, Jack Johnson lifted a lyric from the opening track: a warm and wistful meditation on keeping perspective in frenzied times. Produced by Johnson and Robbie Lackritz (Feist, Bahamas), the new LP came to life at the Mango Tree Studio, the home recording space where he’s created each album since 2003’s On and On. While his longtime bandmates accompanied him on several tracks, Johnson handled most of the instrumentation on his own, sculpting many of the songs around his graceful guitar performance. But despite the simplicity of that approach, All the Light Above It Too emerges as an album that’s undeniably rich in both texture and emotion. In shaping the emotional terrain of his seventh studio album, Johnson drew from life-changing experiences like his recent sailing trip through the North Atlantic Ocean with 5 Gyres (a nonprofit organization focused on fighting plastic pollution). “Being out on the ocean with no distractions, no TV and no cell phones, that really kickstarted the songwriting process and helped me work through things that had been on my mind,” notes Johnson, whose journey was chronicled in the 2017 documentary The Smog of the Sea. With his soulful melodicism and heartfelt storytelling, Johnson turns the album itself into a lovely respite from modern-day anxieties, even as he muses on the many troubles at hand. The album opens with “Subplots,” which begins by bringing lilting guitar work and serene harmonies to the easy wisdom of its titular lyric (“All the light under the sun/And all the light above it too/It don’t shine for you”). The tracklisting continues with the lush and atmospheric “You Can’t Control It” which speaks to the pain and beauty of surrendering to collective experience. On “Sunsets for Somebody Else,” Johnson’s tender vocal delivery delicately contrasts his worrying over our nonstop media exposure (“Can this world not afford to sleep anymore?”). And on lead single “My Mind is for Sale,” bubbly rhythms and cascading guitar tones build a brilliant backdrop to the album’s sharpest lyrical barbs (“I don’t care for your paranoid us-against-them walls/I don’t care for your careless, me-first-gimme-gimme appetite at all”). In its final few tracks, All the Light Above It Too unfolds with some subtle commentary on the bright and dark sides of human behavior. On “One Moon,” with its hypnotic slide guitar and intricate folk flourishes, Johnson reflects on the absurdity of casual greed. “I was on a camping trip with the family, and we were talking about how other planets have more moons than we do,” he says. “It kind of became a joke about being jealous of those other planets—that mentality of always wanting whatever your neighbor has.” Driven by nimble drumbeats and a bass-heavy groove, “Gather” twists a caveman-versus-modern-man metaphor into what Johnson describes as “a back-and-forth between people who are thinking about basic survival and people who are thinking about going out for coffee.” And on the album-closing “Fragments”—a slow-burning track complete with blistering guitar solo—Johnson transforms his restless frustration into a gently powerful message of positivity. That rare balance of quiet introspection and thoughtful observation has driven much of Johnson’s songwriting over the years. Born and raised in Hawaii, he grew up surfing and playing guitar, and released his debut album Brushfire Fairytales in 2001. Since then, Johnson has released 6 more studio albums and 2 live albums that have sold over 25 million copies worldwide. His Brushfire Records label and touring crew have been leaders in the greening of the music industry and his All At Once social action network connects fans with local non-profits at each tour stop. In addition, Johnson and his wife Kim co-founded the Kokua Hawaii Foundation to support environmental education in Hawaii’s schools and communities, as well as the Johnson Ohana Foundation to foster environmental, art, and music education worldwide.